Recently I have been looking into the health & fitness section on Pinterest a lot more, it has inspired me to make my own fitness routine. In this post I am going to be putting in different videos and work outs that I (an possibly you?) can come back and look at when I need to get myself back on track. Also, some of this may seem like nothing to you, but for someone who is out of shape and doesn't eat very healthy it is a good start. But this may also seem like I am setting some unreachable goals, it seems like that to me but I am going to try my hardest to stick to it. My main goal is to work on my stomach so along with my other work outs I will be doing this every day. I like how this is a calendar so each day the work out gets a little bit harder. This calendar isn't from this year but that doesn't bother me since there is the same amount of days anyways, i'll just remember to leave Sundays as rest days. I really like this photo because then you aren't focused on the same workout routine every day, and each day it is switched up for a different part of your body. 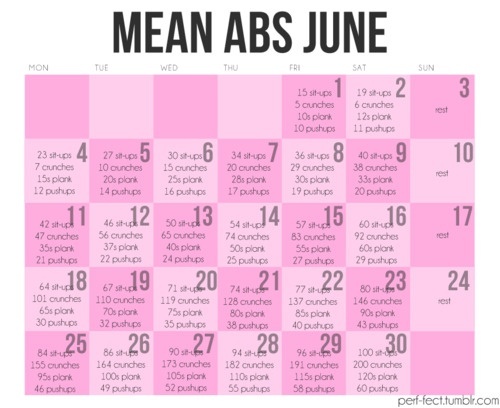 I think for the ab days I will use the June calendar work out for the day instead of the one on the above photo. That is mainly my workout plan, but if I am feeling a little more different, or not tired enough, I can use one of these next videos. I really like this video, probably because I loved hip-hop dance ever since I was in it about 5 years ago. The girl is really energetic and funny too! Okay this one is CRAZY and I know for sure I won't be able to do all of that right away but there is some good work outs in there to try. The abs on this girl are insane, holy! I have already tried this one and it is very difficult to do (for me anyways). It would probably be easier to do if you are able to remember the routine, and can actually handle it ahah! This last video (link above) is the best yoga video that I could find that went through the sun salutation slow enough but wasn't a 20 minute video. In the summer time I love to wake up at 5AM and sit on the dock across from my house to watch the sunrise. It would be a dream to do yoga on the dock during the sunrise. Now onto the food part... I am a huge snacker, and luckily it is healthier to eat small meals throughout the day instead of 3 main meals. But I am a very unhealthy eater and I would like to change that since I hate feeling like crap all the time from all the crap I consume. There we go, my summer health & fitness plan! I really hope I can stick to it! 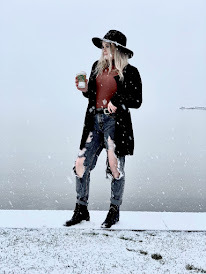 If I find some other things on Pinterest that interest me I will most likely make an updated post OR make a whole new series. Happy June everyone! I have heard of it before but never checked it out, I'm planning on trying it out tomorrow!